And so starts a new series here at KateHorrell.com – scholarships and grants! 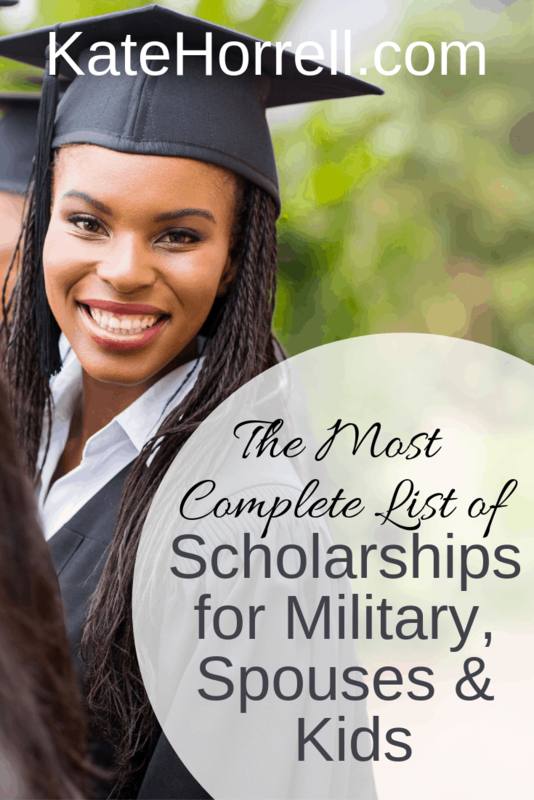 Now, this listing is only military-related scholarships. There are a bjillion other non-military scholarships and grants, but I’m not going to list them all here because there are many resources to help you find them. One of the best scholarship websites is Chegg Scholarships, which seems better organized that some of the other other choices. Read through the requirements at least two weeks before the deadline. Yes, you might be able to do it more quickly (and you might have to, for some of these April scholarships and grants), but most applications require help from people outside your family: a recommender, your guidance department or records office, or some other group. Plus, essays almost always improve with time. Find local scholarship through your school. The counseling office or financial aid office probably has a list or a place that they post scholarships. Research local community groups and businesses. Organizations like the Elks, Kiwanis, Chamber of Commerce, school parent teacher organizations, and even some businesses will offer scholarships. Now look through the lists! Be sure to check back regularly, as I am always finding new scholarships to add. the rest will be coming, asap!